This handmade black tea has a rich, sweet flavor and a roasted yam aroma, without even a hint of bitterness. Our Jin Kong Que (Golden Peacock) comes from Fengqing County in Yunnan Province. This handmade black tea has a rich, sweet flavor and a roasted yam aroma, without even a hint of bitterness. 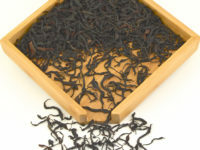 It is less expensive than our Golden Buds, but is still an excellent example of a unique and complex high-end black tea. The name “Golden Peacock” comes from the Dai (Thai) people, who frequently grow and pick tea in their mountain gardens and cherish the peacock as their lucky animal. There are many minority groups like the Dai living in this region, each with their own unique culture. However, they all share a great respect for tea. Yunnan Province began producing black tea in 1939. The Chinese wanted to move the business of exporting of tea out of the east coast of China (then occupied by the Japanese Army) to the border of Burma in Yunnan. Two accomplished tea masters, Feng Shao Qiu and Fan He Jun went to Yunnan to research the area for tea cultivation. They found that Feng Qing County in southwest Yunnan was an ideal place to start producing good quality tea. The rich red soil in this area was high in nutrients and already growing a good number of tea bushes. They set up a factory and began to produce a large amount of tea. Fengqing County is also home to a famously old tea tree called “Xiang Zhu Qing Cha Zu” which still stands today. It is the largest and thickest tea tree ever discovered. Estimated to be 3200 years old, the tree exists under national protection because of its botanical significance. The diameter of the trunk of 1.84 meters thick, or 6.04 feet! No chemical fertilizer, pesticide, or herbicide was used in the production of this tea. Click here to read more about our promise to fair trade and the environment. Learn more about Black Tea. Yunnan big leaf tea bush. Everyday life in Kunming City Capital of Yunnan Province can include drinking tea and singing opera in the park. Yunnan Province is home to a diverse ecosystem of reptiles, insects, and tropical plants. After oxidation, the color of the leaves turn from green to red-brown. During fermentation, the tea is covered with a wet cloth, while the tea is kept in a bamboo basket. Infusion: First infusion at least 1 ½ minutes. The leaves are good for 6 infusions. Add a little more time for each subsequent infusion.